Compact Relay card to receive three relays 18xx or Gx type (GE, GAD, GRR,GCD,…). 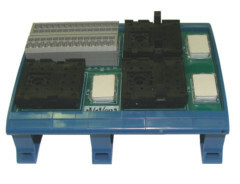 The card can be mounted on Din rail, its wiring is facilitated by spring terminals which are marked according to CENELEC standard. A label-holder by relay allows to identify/recognize relay. This product, incorporated into a switchboard, has had a whole qualification for EPR of Flamanville.